East Bridgewater/ Pembroke/ Plympton/Middleboro & Southeastern MA Delivered. 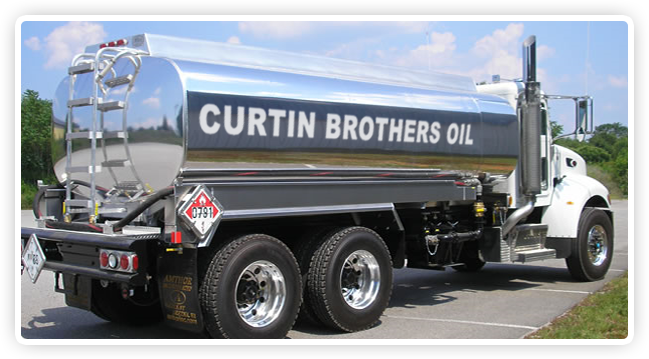 Click Here to view all towns served by CURTIN BROTHERS OIL. CURTIN BROTHERS OIL! Delivers at a Great Heating Oil Price / Delivery with Outstanding Service! Same Day! CURTIN BROTHERS' goal is to deliver quality home heating oil at a great price to your home when you need it / 7 days a week in the heating season, October 1st through April 30th. Out Servicing The Competiton! CURTIN BROTHERS OIL--BUILDNG WARM RELATIONSHIPS EVERY DAY!! Why Use Curtin Brothers Oil? A Locally Owned Halifax MA Heating Oil Company. Heating Oil Delivered Promptly-Great Heating Oil Price$ With Great $ervice. "Diesel Delivered" Premium Off Road. On Site/Cranberry Bogs/Equipment. Dependable Referral Oil Burner Service Available. Fuel Assistance Accepted For Heating Oil. We Accept Master Card, Discover, & Visa Credit Cards.